You’re in the process of rodent removal. Great, so no more little destructive animals squatting in your residence! But what about the extensive waste they can leave behind? When urine, feces, and pheromones are left untreated, it’s a sure-fire way to get structural damage, foul smells, disease, and more critters moving in. The typical last step to animal removal, besides patching up entry points in a building, is to clean up the mess they left. The smallest of rodents can cause bigger damage to a home than you’d believe. Feces and urine can build up in insulation and rot between floorboards. The rodents’ nests can contain plenty of odd materials scavenged from human places. There’s a reason rats do so well in urban environments — they love tiny hiding places and scavenging trash! Chicago, New York City, and Washington D.C. boast the most robust rat populations in the U.S. as a result. Don’t worry, once rodent removal services take care of the unwanted rodents themselves, they’ll typically take care of most of the big messes. If your infestation was in an attic or crawl space, a common method of cleanup includes special vacuums and then a “fogging” technique to get rid of solid waste, eliminate strong smells, and kill any remaining bacteria and mites or fleas left by the rodents. It’s highly recommended to let professionals handle attic clean-ups, as they have the protective gear and experience necessary to safely handle it. They can also give you an idea of the damage done, such as how much insulation needs to be replaced. Say your unwanted rodents, like house mice, liked to peep around your kitchen at night looking for a snack. As a result, you’ll likely find bits of feces. Rest assured if there are feces that there are probably traces of urine and other waste, too. How do you as the homeowner clean it up safely? For many homeowners, their first instinct is bleach. Why not, bleach kills all kinds of bacteria, right? But this can actually be quite unsafe. Mammals (including people!) have ammonia in their urine and waste products. Mixing ammonia with bleach creates mustard gas, which can easily cause painful chemical burns in the lungs when inhaled. It’s always recommended to first clean up rodent waste with an enzymatic cleaner. Many products specifically created to clean up pet messes will work just fine. Dawn dish soap is a good pre-bleach cleaner as well. Once that first cleaning attempt is dry, the ammonia will be gone. You can then use a small amount of diluted bleach to wipe down the affected areas and kill any remaining bacteria. For ANY size left from unwanted rodents, it’s highly recommended you wear gloves when wiping them up. For larger messes, you may want to wear eye protection and respiratory protection such as a filtered surgical face mask you can buy at hardware stores. Respiratory protection is typically recommended for cleanup purposes anyway. Rat feces especially can contain hantavirus, a flu-like disease that can often be deadly if spread to the lungs. 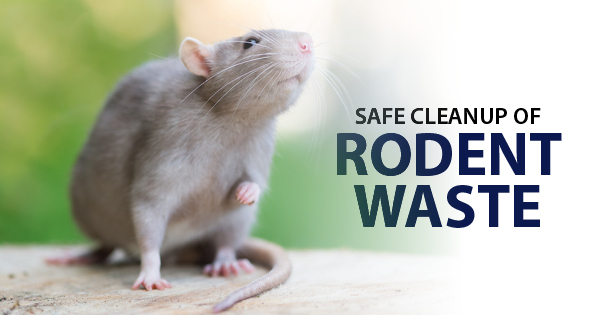 Remember, if you’re unsure about handling rodent waste yourself, then default to calling professional rodent removal or clean-up services! It’s not worth getting yourself and your family sick to spare your local rodent control a trip to your home. Animal removal and clean-up can be stressful, but safety should be everyone’s first priority.